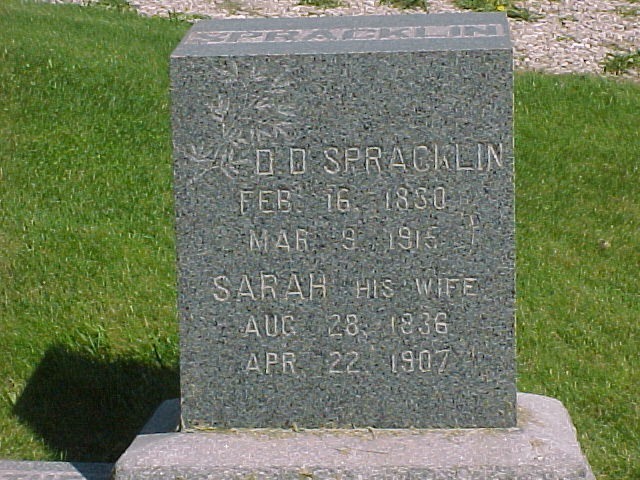 Daniel and Sarah Spracklin's youngest son Alfred died at about the age of 17. As I have mentioned, family lore says he may have died of a snake bit. I have not been able to find an obituary notice on Alfred to verify. I have studied Iowa County newspapers but was unsuccessful in finding an obituary notice. Of course, I need to study the Deep River newspapers in Poweshiek County and I have just not focused on that at this time. There has been a little confusion about his actual year of death Some sources give 1893 others give 1899. 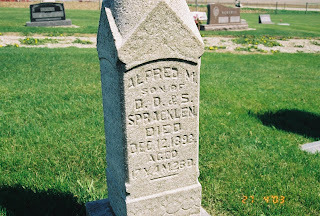 The publication "Millersburg United Methodist Church 1890-1990 Serving for a Century" gives the following information about Alfred's death: #395 Row 10, Stone 11 - Alfred M. Spracklin Died: December 12, 1893 aged 17 yrs 4 mos 26 days. 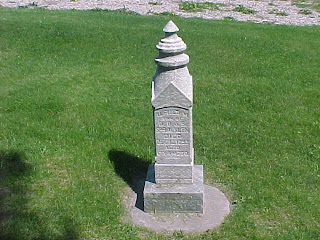 In this close up we see that it is 1893 on the tombstone. The name is spelled "Spracklen" and not "Spracklin," like his father's tombstone. 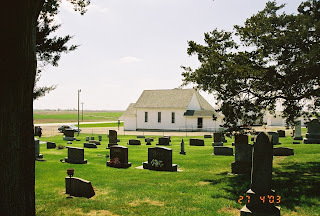 Death Records 1880-1918, Poweshiek Co., Iowa - Register of Deaths no. 1 1880-1893 #1028406 Item 5, No Alfred found. 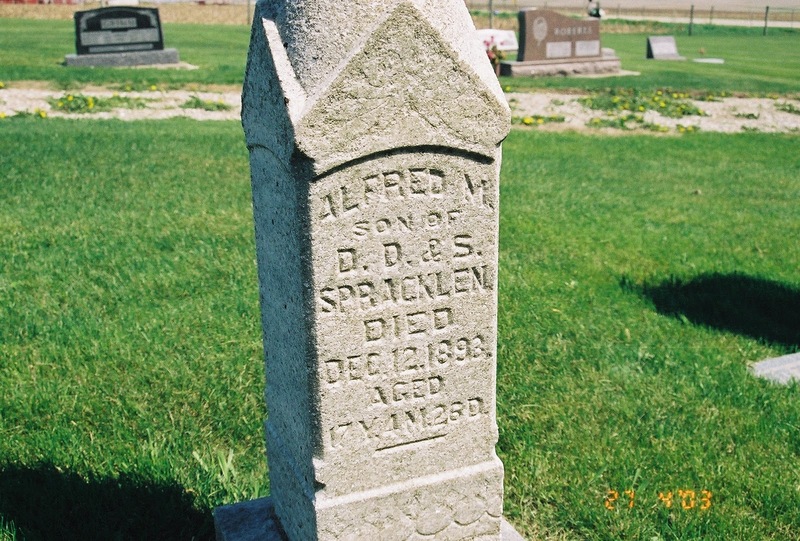 Register of deaths v. 2 1893-1901 FHL#1028407 Item 1, No Alfred Spracklin found. Record of deaths v. 3 1897-1908 FHL#1028407 Item 2, No Alfred Spracklin listed. Death Records 1880-1935 Iowa Co., Iowa Register of Deaths v. 1 1880-1904 FHL#988209 Item 1. No listing for Alfred Spracklin for either 1893 or 1899 second checking of these records. It is possible that Alfred died in another county? 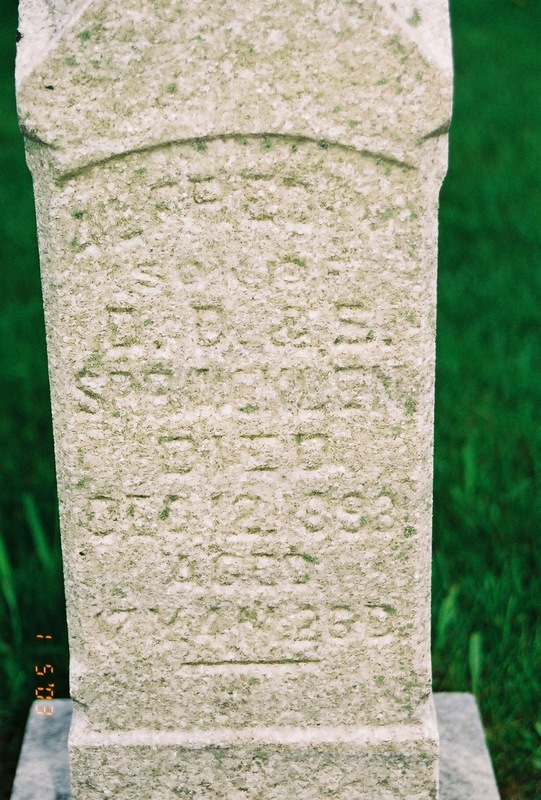 His brother's and sister lived in Calhoun Co., Emmet Co., Keokuk Co., Scott Co. and several others. He might have been visiting and that is why I have not been able to locate a story of his death. I do not yet feel I have made an exhaustive search so it is on my To-Do list for the future. 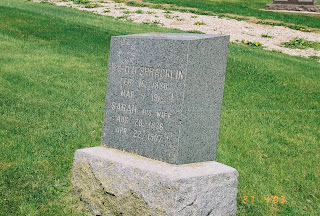 My 2nd great grandfather Daniel D. Spracklin is buried in the Community Cemetery 11 miles west of Millersburg, Iowa. I visited his grave in 2003 once with my cousin Jerry who had located Daniel's grave site. I visited it again, alone, before I left to return home. I must admit leaving an ancestor behind always tugs at my heart. There is something very satisfying about the motion of the car as it dips and glides across the land following the road to a cemetery. The next is the feeling of walking the land, studying the tombstone(s), and then looking in different directions as you experience the land and what life might have been like for your ancestor. Page 68 of the publication "Millersburg United Methodist Church 1890-1990 Serving for a Century" lists D.D. as #392 Row 10, Stone 10. Sarah is listed as #393 Row 10, Stone 10. Sarah was Daniel's second wife and they had seven children: Lydia, Virda, Reed, Daniel, Peter, Charles, and Alfred. Daniel's first marriage to Elizabeth produced four children: Henry (Jerry's ancestor), Oliver, Mary and Amarilla, my ancestor. I obtained a copy at the Iowa County Genealogical Society. 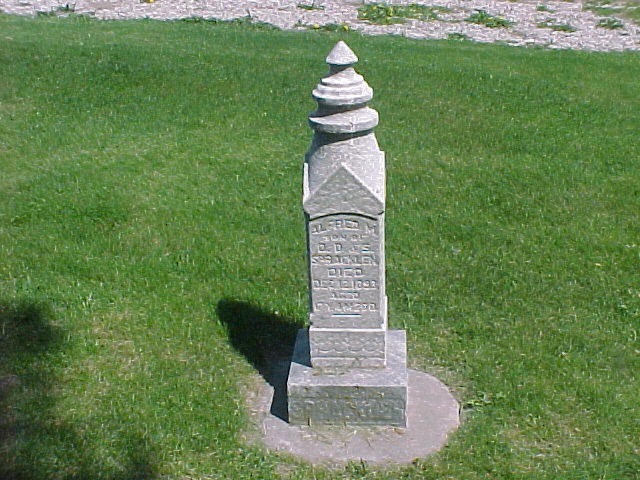 ﻿The small stones on either side of the large one read: "Mother" and "Father." Their son Alfred is to the north (left) of this stone. Fortunately this cemetery is well maintained. 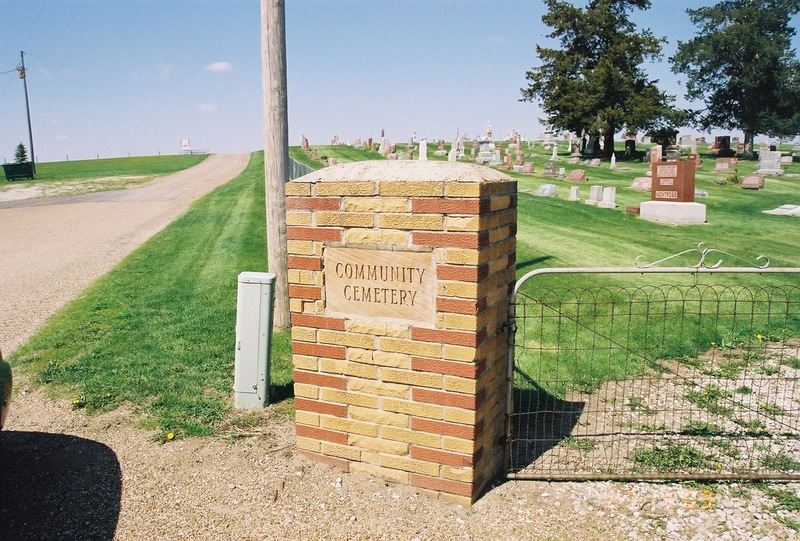 The next cemetery we will visit is the Community Cemetery 11 miles west of Millersburg on Hwy 52 on the way to Deep River. 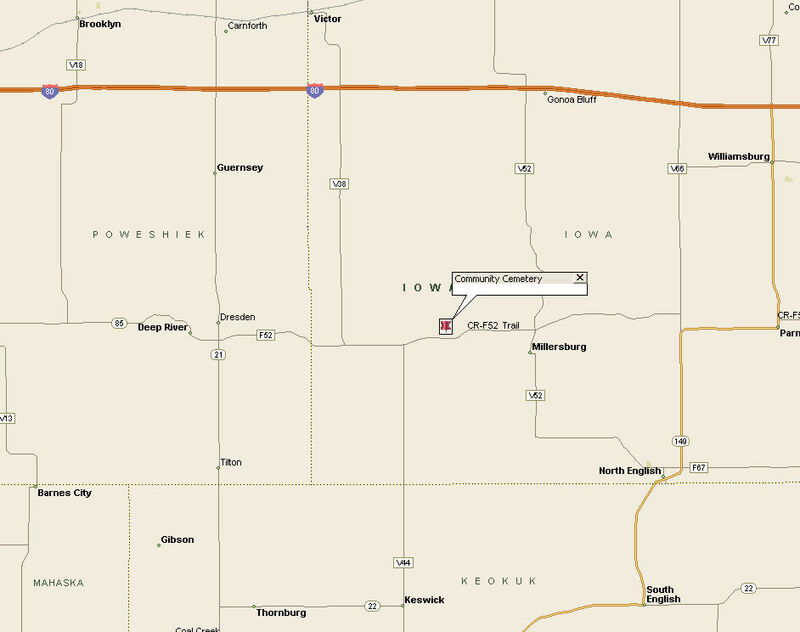 Millersburg is located in Iowa County and the town of Deep River is situated in Poweshiek County. If you were researching this ancestor you would have to study both counties in order to find the documents. It is on the right as you go west next to the church and parsonage in section 11 of Iowa County. 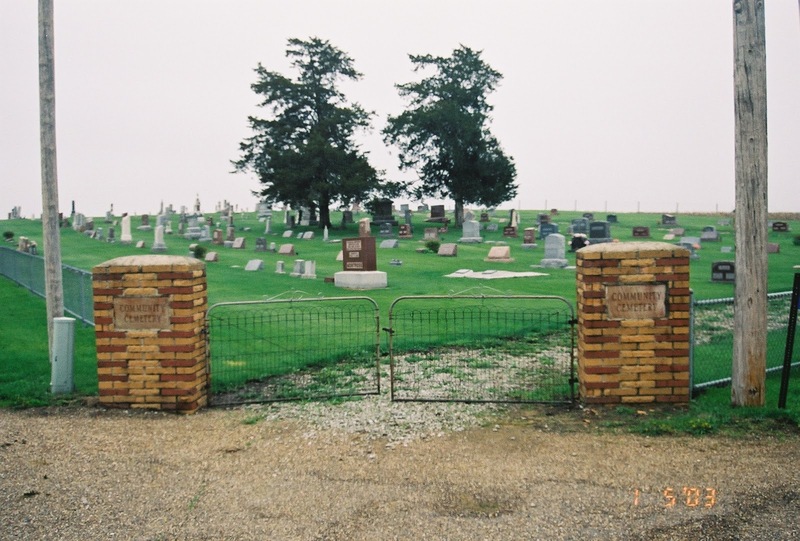 Here is a map that can help you locate this cemetery; however, if you drive along Hwy 52 you will not be able to miss it for it is a very open area and not shrouded by trees. 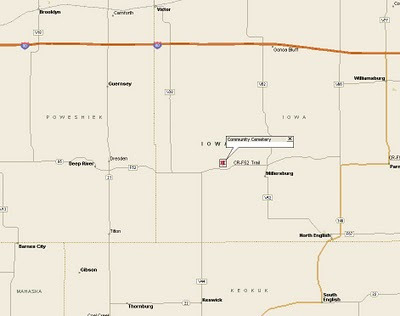 The main Hwy is Interstate 80 which goes through just about the middle of Iowa from east to west. 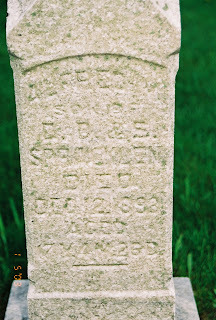 My focus on visiting this cemetery back in 2003 was to view the grave of my 2nd great grandfather Daniel D. Spracklin. 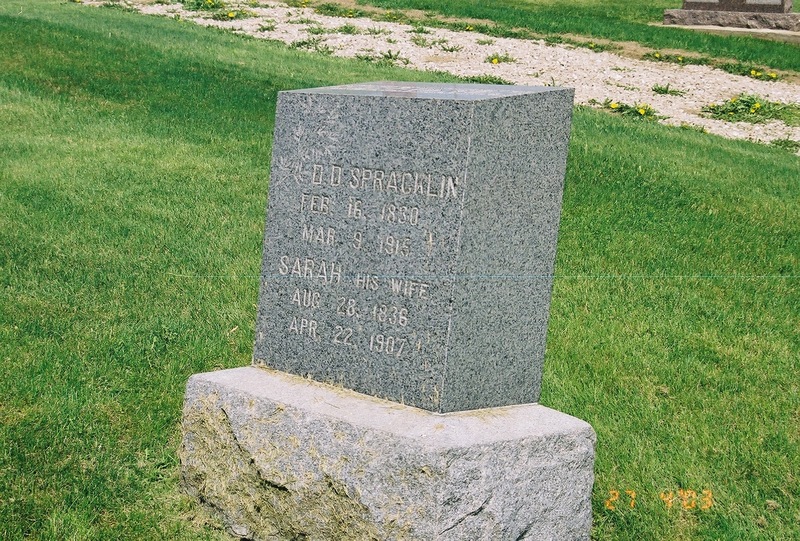 He was the husband of Elizabeth Spracklin who was featured in the Titler Cemetery posting dated September 11, 2010. 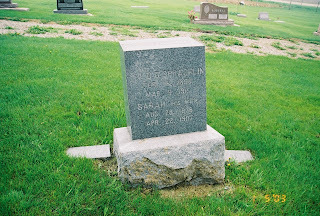 Elizabeth died on 10 March 1859 and Daniel remarried on 21 November 1863 in Marengo, Iowa to Sarah Blacketer Allgood. 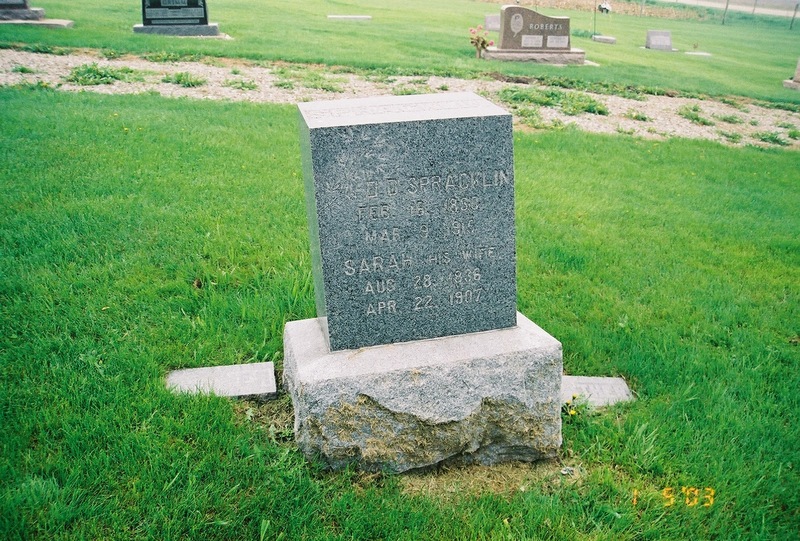 I did not record the Dayton Community cemetery but I do have overview photographs and photographs of my 2nd great grandfather's tombstone which also includes Sarah's information. I also took photos of the tombstone of their youngest son Alfred. The family lore in the cause of his death is that he might have been bitten by a snake. I have yet to confirm that story. There is a publication for this cemetery "Millersburg United Methodist Church 1890-1990 Serving for a Century." I obtained a copy of the page I was interested in when I visited the Iowa County Genealogical Society located in the Marengo Public Library. They have since relocated to the town of North English south of Marengo. See the link to the right in the link column for more information on the genealogical society. http://iagenweb.org/iowa/cem/1975-lillie/p039.htm for this cemetery. It does not yet list the burials at this time.